This 1 oz Gold Wafer from the esteemed Royal Canadian Mint has been a favourite of leading investors and collectors for over 10 years. Combining outstanding security features with elegant design and detail, the 1 oz wafer is a smart choice for those who want a solid investment or a reliable buffer from the effects of inflation. Recognised all over the world, the RCM 1 oz wafer can be easily liquidated if required. Gold has been valued for its beauty and purity for hundreds of years. Each 1 oz wafer from the RCM contains a full troy ounce of fine .9999 purity gold. Wafers are supplied in a sealed tamper-proof card that shows the bar's unique serial number and is signed by the Chief Assayer of the Royal Canadian Mint. Its iconic maple leaf symbol is an attractive detail for collectors. CoinInvest.com is pleased to offer the 1 oz Gold Wafer RCM at attractively competitive prices. 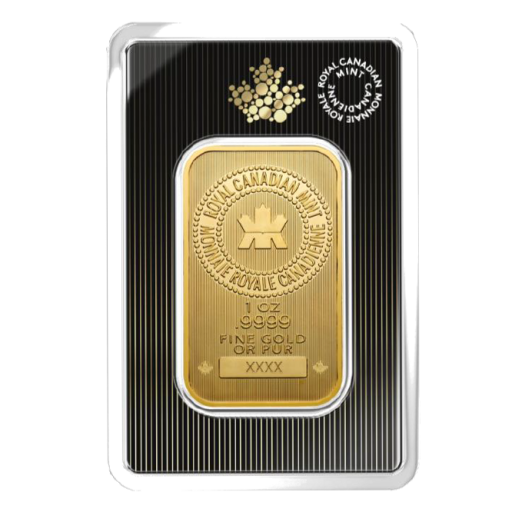 As a trusted supplier for the Royal Canadian Mint, we are able to buy in bulk and cut costs for our clients. Single 1 oz Gold Wafer RCM are supplied in sealed assay packaging while orders of 25 come in sealed boxes. CoinInvest.com aims to ship all orders quickly and securely allowing you to enjoy your 1 oz Gold Wafers from the Royal Canadian Mint sooner.